Weingut Rainer Schnaitmann was founded in 1997 in Württemberg. The estate has grown from 2.5 hectares to 25 hectares since that time. Rainer Schnaitmann cultivates a range of grape varietals on his estate, practices organic viticulture and uses 90% wild yeast in his ferments. Lemberger is an early budding and late ripening German red grape grown windely in Wurttemberg. It is the same as Autria’s Blaufrankish and Hungary’s Kekfrancos. 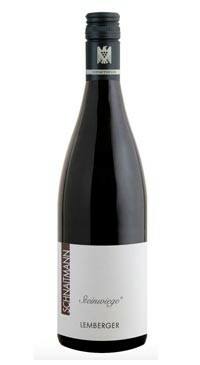 This is a deeply pigmented wine with a pronounced nose of ripe cherry, blackberry, licorice, bay leaf and vanilla. Ample fruit on the palate; though the wine is fully dry. Lots of cherry, herbal notes and a flinty minerality with balanced acidity and tannin on the long finish.